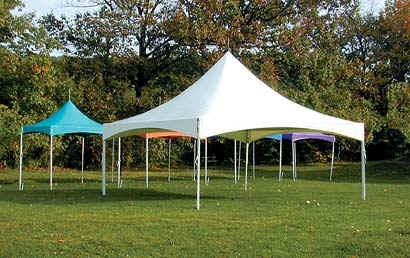 This is the new "Vista" style 20x20 pole tent which is also available in the standard canopy sytle or as a frame tent. Great for shade on a hot summer day or for rain on a not so hot one. Our all white tents look great at formal events. These tents can fit 4 tables and can seat 24-40 guests comfortably.